Fear is a huge issue for many people. Just think about these two things and then shout out some ideas - sensible and silly! 1. What things do people fear? 3. Why do people fear things? What causes fear? Worship Songs to play - just some examples! Isaiah 41.10 - So do not fear, for I am with you; do not be dismayed, for I am your God. I will strengthen you and help you; I will uphold you with my righteous right hand. Through the whole Bible, God says to his people, 'do not fear'. Instead he encourages us to trust him. Trust in God and his love is the opposite of fear and it is the thing that fights fear. 1 John 4.17-19 - This is how love is made complete among us so that we will have confidence on the day of judgment: in this world we are like Jesus. There is no fear in love. But perfect love drives out fear, because fear has to do with punishment. The one who fears is not made perfect in love. We love because he first loved us. The first thing to know about the kind of fear that makes us scared and intimidated is that it is not from God! Yes there are times when we feel fear but when it stops us from living life or doing right things, then we know it's not from God! There is a kind of natural fear that God's put in us to warn us and help us stay safe. Some people's limits of this kind of fear can differ - which is why some people do extreme sports and others can't do them! 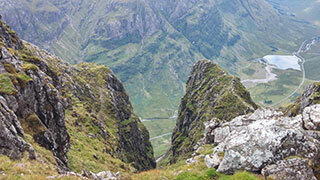 I felt some natural fear when I was scrambling over a classic Scottish ridge called Aonach Eagach in the Glencoe area. This was a good thing as with 600m drop offs on either side, it helps focus your mind so you stay safe! Another type of fear is the fear of God which we look at in another session on fear on myfishbites. This is a good kind of fear which we can kind of explain as not really being 'fear' as such but more like 'awe' and 'reverence'. This was the fear of God that Isaiah found in Isaiah 6 when he had an awareness of the power and presence of God and fell down on his face, saying he was unworthy. God is good and we have been made right with him through Jesus. But the fear of God is just getting God in his rightful place - King, awesome God and the creator of all things. This is the kind of fear we have to resist. It's the kind of fear that makes us worry, panic, feel despair, feel defeated, crushes us and stops us doing good things or even from living life. It's not from God, it's from satan and we must fight against it! The great news is that God has given us spiritual weapons to fight this kind of fear. There is hope - God has given us a sound mind! God is bigger and greater than anything - even though there is often a process to walk through with God. But know that this kind of fear is never from God! 2 Timothy 1.7 - For God has not given us a spirit of fear, but of power and of love and of a sound mind. A good place to start is to shout out any ideas you may have about how we can fight fear. If you download the PDF at the top, you'll also find a page that can be cut and handed out so people can take notes away and write down their own ideas. So the question is: What kinds of things can we do to fight fear? Earlier we said that it's good to know that this kind of evil fear is not from God. One of the things we have to get settled in our heads is that God is good and he has good plans for us. If we know something is from the devil, we can fight it. Imagine if you were in a war and someone was firing at you with a sniper rifle. You would need to identify where that person was before you could defeat them. This is the same with the devil who is an enemy and seeks only to kill, wreck, steal and kill what God makes and what God does. Psalm 34.8 - Oh, taste and see that the Lord is good; Blessed is the man who trusts in Him! Time after time, we find that the Bible tells us not to fear and not to worry. So we know that it's God's will that we don't worry. He doesn't want us to worry and have this horrible fear because it's not from him. In Isaiah 41.10 God said 'don't fear because I am with you.' We also know that Jesus told us not to worry about things in Matthew 6. Later on, Jesus said to his disciples (and to us as his disciples!) that we shouldn't let our hearts be troubled (see John 14). Peter wrote in 1 Peter 5.7 that we should throw all of our cares on Jesus because he cares for us! Then in the book of Philippians, Paul took up this theme in chapter 4, telling us not to worry about anything but to pray about everything, asking God to answer our prayers, thanking him for his answers in faith! That just means we believe that God will do what he has promised to do because of who he is! The other weapon is the Bible itself. The Bible is full of promises and truth. The Bible is truth (John 17.17). We have amazing promises that God has given to us (see 2 Corinthians 1.20). Faith comes by hearing the Word of God - this means that as we read, say out loud, speak out and believe the Bible, God makes his promises a reality in our lives. It's not always in the way we expect but God's Word says that it always does what God promises it will do - see Isaiah 55.11. So when we find promises in the Bible, we can agree with them, we can believe them and we can speak them out, making them personal. So we can say things like, "God you told me not to fear because you are with me so I choose not to fear but to trust you." If there is one important thing to learn it's that when we have fear, worry, wrong thoughts, sinful ideas - these all start in the mind and often when we allow wrong and negative thoughts in our heads and then think about them! Stop! Did you know that God has given us a sound mind (a disciplined mind with self control). So we can actually choose what we think. in the book of 2 Corinthians 10.3-6, Paul tells us that we can actually choose what we think and we can resist wrong thoughts. Instead we can think God-thoughts and agree with what God says about us. This is also written in Philippians 4.8 when Paul encourages us to think on things that are right, true, pure etc. If we're thinking about those things then we're not thinking wrong things! Sometimes the Bible tells us to 'meditate' on Bible verses. This doesn't mean we have to sit crossed-legged with our arms out humming some kind of weird hum with our eyes shut!! Instead it means we think about the Bible and what a certain verse says. Sometimes people think this is weird but think about this - when you worry and think about fears, you're meditating on the fear! So you're actually doing meditation but it's on wrong things. It shows that you can meditate (think about) the right things - God's truth about you! Remember that God hasn't left you alone in the world! He's given you family (hopefully - or there's always your church family!) He's given you a church, a youth group, friends (hopefully - make sure they're good ones!) and he is with you all the time. We have the amazing power of prayer - so get people to pray for you and even pray for any kind of issues in your life - that God would help you and deliver you from all evil. Isaiah 55.11 - My word… shall not return to Me void, But it shall accomplish what I please, And it shall prosper in the thing for which I sent it. Mark 11.22-24 - So Jesus answered and said to them, “Have faith in God. For assuredly, I say to you, whoever says to this mountain, ‘Be removed and be cast into the sea,’ and does not doubt in his heart, but believes that those things he says will be done, he will have whatever he says. Therefore I say to you, whatever things you ask when you pray, believe that you receive them, and you will have them. Acts 10.38 - God anointed Jesus of Nazareth with the Holy Spirit and with power, who went about doing good and healing all who were oppressed by the devil, for God was with Him. Ephesians 2.8 - For by grace you have been saved (sozo) through faith, and that not of yourselves; it is the gift of God. Hebrews 13.8 - Jesus Christ is the same yesterday, today, and forever. So when we feel fear, here are some tips! 5. Now don't speak about your fears, just keep on believing God and speaking his word of truth. Ask God if there's a specific Bible verse for you or something you need to do or pray. Get others to pray for you and stand in agreement with you. 6. If you need to take any practical action, do that. The thing about fear is that (like Joshua in the Bible, see Joshua 1), you can feel fear and do things anyway. You can do things afraid. I've had to do this many times and with God's help and support of others, you can do it. Lord, deliver me from all my fears. I choose to believe that you are good. I choose to be a fear fighter. I trust you. You are greater than everything and anything. If God is for me then what can come against me. Thank you that you are always with me, always want the best for me. Thank you that you are my healer and the one who delivers me, rescues me, lifts me out of every pit and makes me whole. Thank you that you have good plans for me, that I've passed out from under the curse into the blessing s of God and that you give good gifts to your children. No weapon formed against me will work and I condemn every wrong word and thought in me and towards me. You alone are God and my Saviour!